Last weekend I attended my 10th bi-annual LoBsterCon, where 100+ London on Board Meetup members head to the sunny south coast and take over one of Eastbourne’s lovely old seafront hotels (The Cumberland) for the weekend. As the winter event always happens a few weeks after Essen its a great opportunity to play some games that came out at the show. I’ll get to my proper reviews (listed here) in the coming weeks, but while you’re waiting for those here are a few of the other Essen hotness titles I managed to get played last weekend. At the time of writing Azul and Ex Libris were available at discounted prices from LoBsterCon sponsor Board Game Guru, so why not go and show him some love – and tell him I sent you! I’m not sure why this one hadn’t been picked up by my pre-Essen radar: abstract, a great designer (Michael Kiesling), solid publisher, great art and tile-laying – so many ticks! It was a big hit at Essen and now, having played it, I can see why. As with all great abstract games you can teach the rules in five minutes – but it is only after a few rounds you start to see the real genius of the game. Tiles in five colours are drawn from a bag and placed randomly, in fours, onto several discs. On your turn you take all the tiles of a single colour from a disc and place any other tiles that were on it into the middle. Alternatively, you can take all the tiles of one colour from the middle (it always has to be all of a colour). On your player board you have five rows in which to put these tiles, ranging from 1-5 spaces in length. Only tiles of the same colour can go into each row, so it soon becomes tricky to take tiles – and any that you can’t place into rows (you always have to take something) will end up scoring you negative points. Once all the tiles are taken, players slide any complete rows across from into their scoring area – then off you go again. I won’t explain scoring, but it is essentially trying to complete rows and columns in your own 5×5 grid – and once one player completes a scoring row the game ends. What soon becomes apparent is you have to plan ahead, but more importantly have to pay close attention to what your opponent’s need – and even more importantly what they won’t be able to take. It’s possible, near the end, to be picking up more than 20 points in a round – but early on it is just as easy to lose 10 points or more. With totally open information it makes practically every decision important and interesting, while striking a great balance between scoring and dicking over your opponents. And with a reverse side of the board with another scoring system, it has replayability too. Azul comes highly recommended and I expect to pick up a copy. This one made my Essen anticipation top 10 list but by the time publisher Renegade had managed to get any of its game on site I’d already filled by suitcase and spent all of the money. It’s a shame too, as I really enjoyed my play of Ex Libris. It’s essentially a set collection game but with just the right amount of bells and whistles to make it interesting. The fantasy library theme makes it look gorgeous, while the cards each contain 2-4 books with funny titles – and there’s the extra challenge of keeping your shelves in alphabetical order, alongside trying to get the right colours of books to score big points. Each player has an individual power only they can use, while in each round four new special abilities are on offer for players to take advantage of (it also has a worker placement element going on). One of these stays in game at the end of each round too, giving players a slightly expanding set of actions to choose from as the game goes on. Turns are snappy (one worker, and done), there are interesting choices throughout and there’s also a decent (although limited) amount of player interaction. This is another game I’d like to get myself a copy of – but I’ll wait for a reprint, as a printing error has led to much of the in-game text on cards being practically unreadable. All you need to know can be looked up in the rulebook, and there is a downloadable player aid you can print out, but with the cost of board games creeping ever higher (this has a pretty ridiculous UK price tag of £60, but is available discounted to around £45) it’s not really an acceptable solution for me. 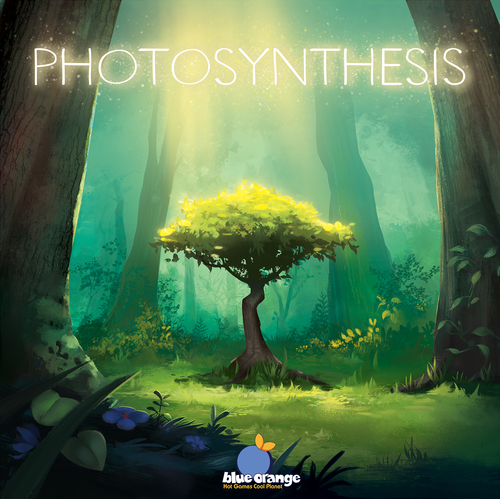 If you want a game that catches the eye, look no further than Photosynthesis. As usual publisher Blue Orange has done a top job of making this look gorgeous, with the 3D trees making it one of the best looking games of this year’s show. In an ode to environmentally friendly forest management, the game sees you growing trees to their full height, chopping them down (to score points) – and then planting more trees in their place. It employs a clever weather mechanism where the sun moves around the edge of the board each turn, shedding light on different areas – and if the light shines on your trees you get more points with which to spend actions. But you need to have you trees high enough at the right time, as other trees in front of them may block out your light. While the game plays smoothly, doesn’t outstay its welcome and could be taught to anyone, I came away from it at the end feeling mostly underwhelmed. While there’s nothing wrong with the game it seems to offer very limited replay value and despite enjoying my time well enough while playing, I certainly won’t be looking out for another play – although wouldn’t turn down a game if someone really wanted to play it. I can see this burning brightly for a short time due to its prettiness, but I’ll be amazed if anyone is still talking about it this time next year.